Paul Sherman, father of the Absolute Linux, announced on January 8th, a new bug fix release of his Slackware-based operating system. Absolute Linux 12.2.1 delivers updated versions for the Pidgin (2.5.2), Samba (3.2.7), the GIMP (2.6.4), WPClipart (7.1), Audacity (1.3.6) applications and the following Mozilla products: Firefox 3.0.5, Thunderbird 2.0.0.19, Seamonkey 1.1.14. Moreover, this point release version of Absolute Linux 12.2 updates the PTP camera auto-mounting feature, the wireless/wired networking manager (wicd 1.5.8) and it also introduces a newer version of the Help System, which is now located on the second disc and works properly. Last but not least, wxPython was updated to version 2.8.9.1 and it replaces the older wxPython and wxGTK packages. "This is primarily a security update. [...] Also in this release, PTP camera auto-mounting has been updated as well as wicd (wireless and wired networking manager), GIMP has been updated twice since the last release, and the newer version of the help system now works properly and is on CD2. Just a couple other updates and you may also notice that the package for WPClipart-7.1 is online and ready to install onto Absolute (note that the complete package is well over 700 MB)" - said Paul Sherman in the official release announcement. 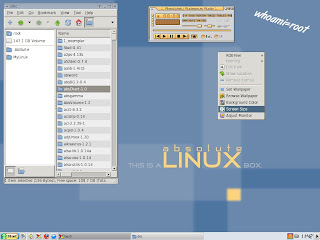 If you want a fast, lightweight, Slackware-based Linux operating system for your personal computer, you can download Absolute Linux 12.1.1 right now from here and here.